If the calendar of an activity is edited or a new calendar is assigned such that it elongates or reduces the length (not duration) of an activity, then the activity’s dates will be adjusted accordingly. However, some activities may have no-later-than (NLT) or no-earlier-than (NET) constraints that become violated due to the new dates falling outside the constraint range. If this option is selected, NetPoint will automatically correct the violating constraints for the activity by moving it so the finish date is the same as the NLT date. If the activity cannot be moved due insufficient float or drift or due to an NET constraint restriction, then the NLT constraint will be silently removed. If this option is selected, then the violating constraints are automatically changed to the new start and finish dates of the activity. This will correct any violations. If this option is selected, the violating constraints will be silently removed. 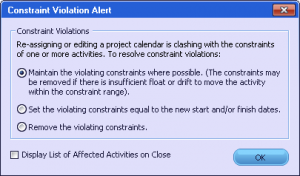 For all options, a checkbox at the bottom may be clicked to display a list of the affected activities along with the information about the constraint, the constraint type that has been fixed, and the constraint dates.